Scientists and conservationists in the United Kingdom have observed a mass die-off of invertebrate sea creatures as a result of recent frigid weather. “There was a 3C drop in sea temperature last week which will have caused animals to hunker down and reduce their activity levels,” Bex Lynam of the Yorkshire Wildlife Trust said in a statement. “This makes them vulnerable to rough seas – they became dislodged by large waves and washed ashore when the rough weather kicked in.” Tens of thousands of mostly dead animals covered the beaches of the Holderness coast in Yorkshire, as well as locations in Kent and Norfolk. The bizarre, tragic phenomenon is all the more unsettling in context; while Europe froze, the Arctic thawed in the dead of polar winter. Although most creatures washed ashore were dead, some lobsters survived the frost. Those lucky few are being gathered up and cared for before they will be releasing back into the wild. “This area is very important for shellfish and we work alongside fishermen to promote sustainable fisheries and protect reproductive stocks,” said Lynam. 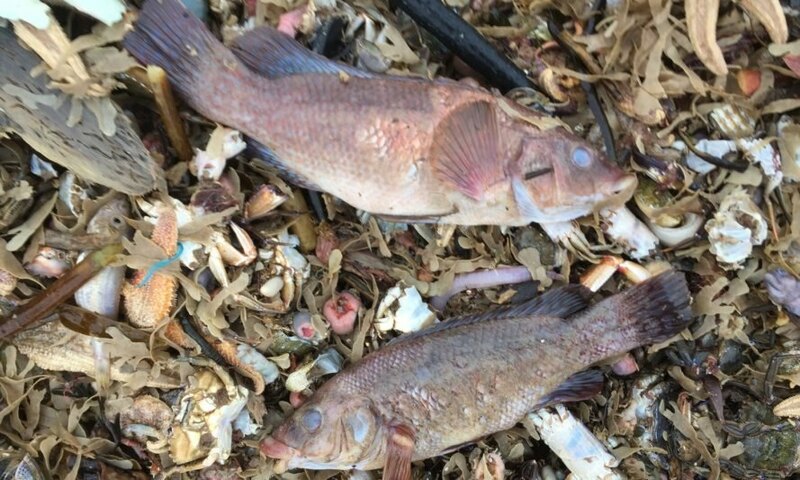 “It’s worth saving them so that they can be put back into the sea and continue to breed.” While some fish did perish, most of the dead were invertebrate species. “Larger animals such as dolphins are more mobile and can save themselves by swimming away when this sort of thing happens,” explained Lynam. Tens of thousands of dead invertebrates line the shores of England. A massive die-off of sea creatures was caused by a drastic drop in temperatures last week in Europe.